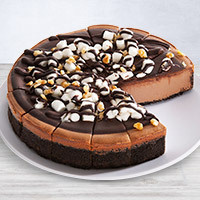 Get the best of both worlds with this dreamy cheesecake. 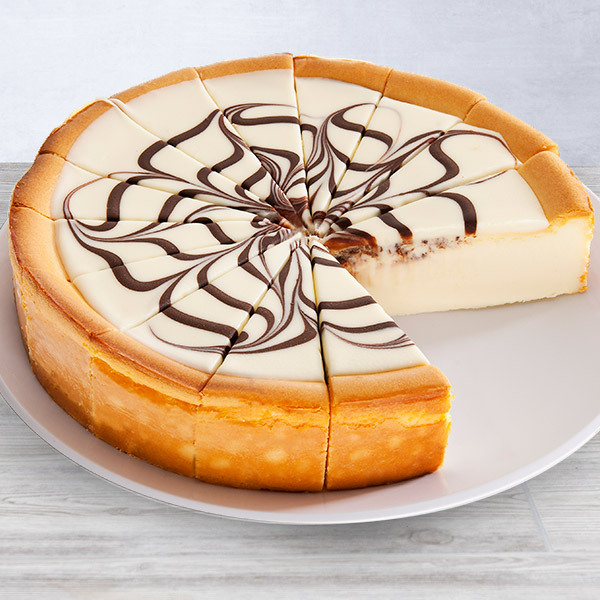 We took our rich, sweet, white chocolate cheesecake that’s hand swirled with rich dark chocolate, and topped it with a white chocolate glaze. Everyone’s going to want seconds of this delicious dessert. I sent this as a birthday present to a cousin out of town. She enjoys sharing so she took it into work. Some cheesecakes are "cheesy" ... she said that with this one there was plenty to go around , and was enjoyed by all ! 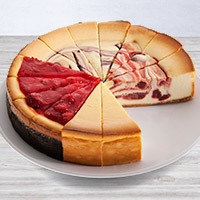 I have purchased four a these delectable cheese cakes. They were all perfect with the exception of the last cake. The white chocolate topping was so uneven that close to half of the slices only had the topping on 1/2 of the slice. It appears that the cake was left to settle on an even surface prior to freezing or during the freezing process.